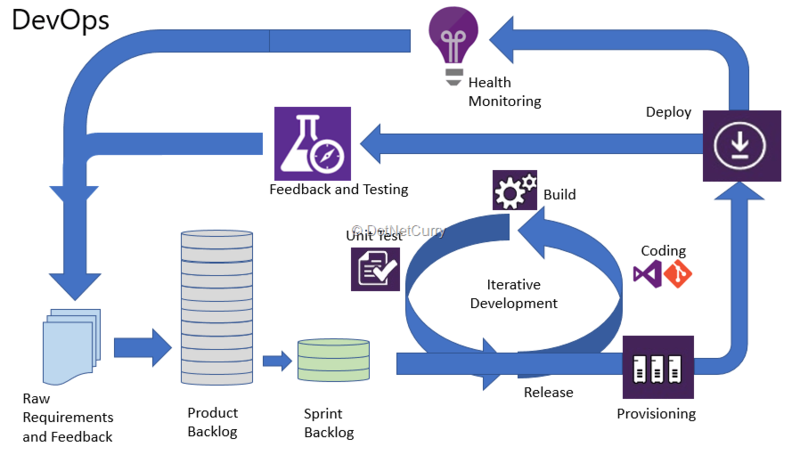 DevOps can be defined as extending agile practices to operations. An important part of ‘Operations’ is to monitor the health and performance of the software after it is deployed to production, and provide a feedback about it to the development team. Microsoft has built an Azure based infrastructure with tools to monitor, collect data and analyze health and performance of applications. 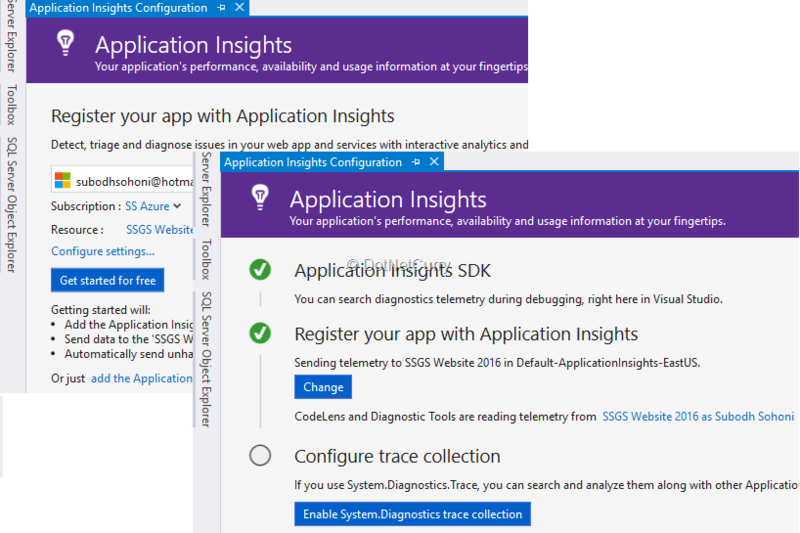 This service offered by Azure is called Application Insights. 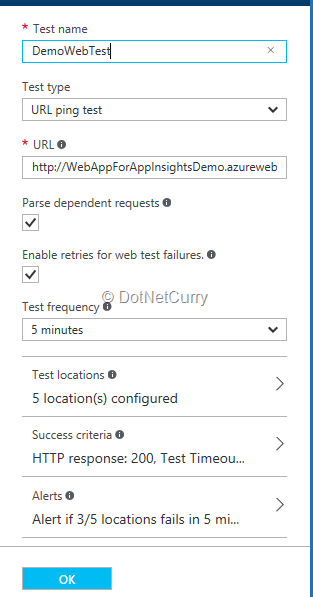 How to install and enable Application Insights for a web application? What monitoring data is collected by Application Insights? How the collected data is reported? 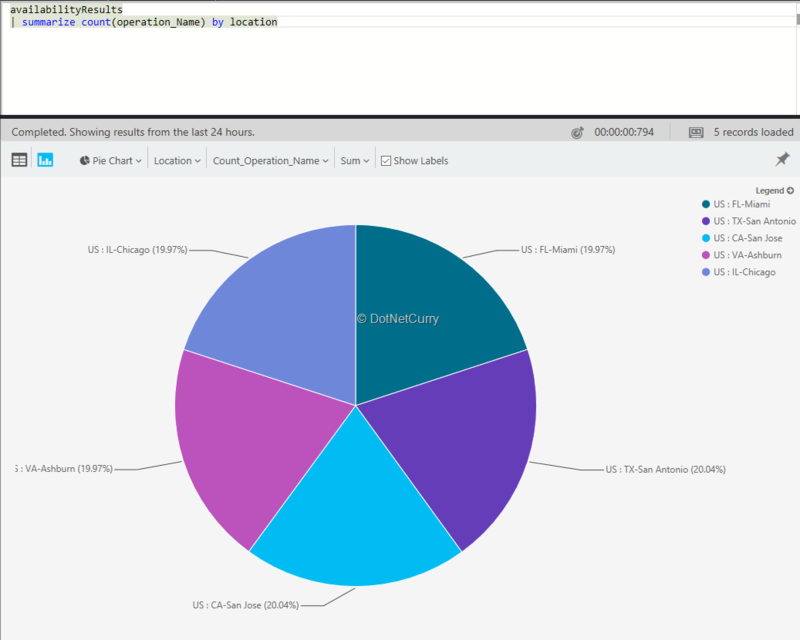 How does Application Insights allow us to analyze that data? Software Operations was done by a separate team (other than the development team). Create necessary user accounts and groups. Set permissions for them. Deployment – Copy files on target machines and install any of the binaries if needed. Feedback and Testing – Run the application and do smoke tests. Do exploration of the application after deployment on the target machine to ensure the sanity of the software. Run automated tests if configured and send the results back to development team. Health monitoring – Continuously monitor the availability, performance and other parameters to optimize the product. As a team member of development team, I also would like to get some statistics and analysis of the usage of the product or the application. Statistics that I expect is for requests that are received by the application, page views, clients, exceptions etc. 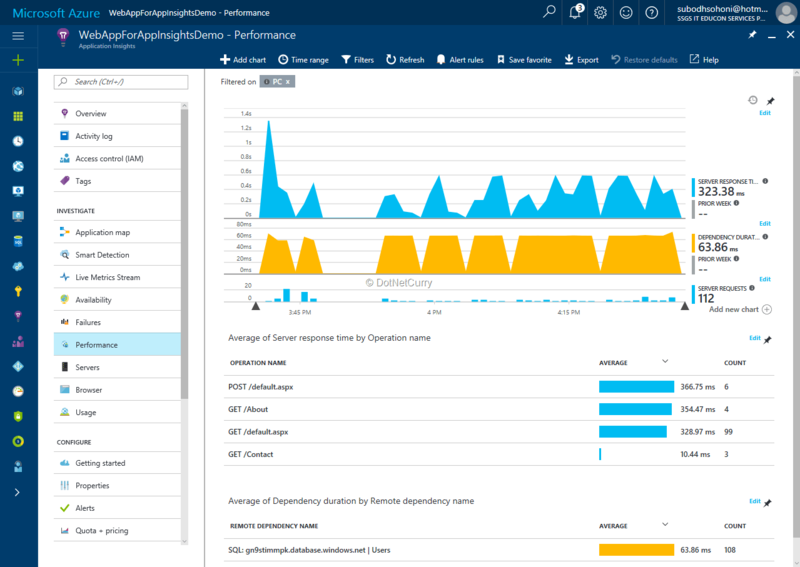 Microsoft has created a service in Azure that is called Application Insights that provides health and performance monitoring, with analytics. 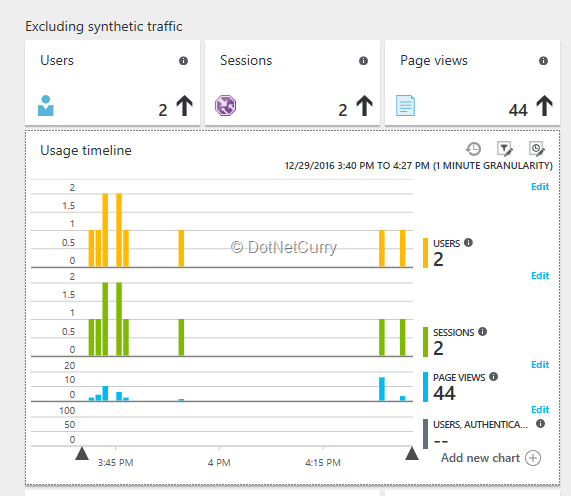 Any application that can access Internet can publish the data for Application Insights. It can be ASP.NET web application hosted in cloud, or on a server in premises, or any other type of windows application including windows services or a Java web application and so on. Today, we are going to take the case of Application Insights for an ASP.NET Web Application hosted in the App Services of the Microsoft Azure Cloud. 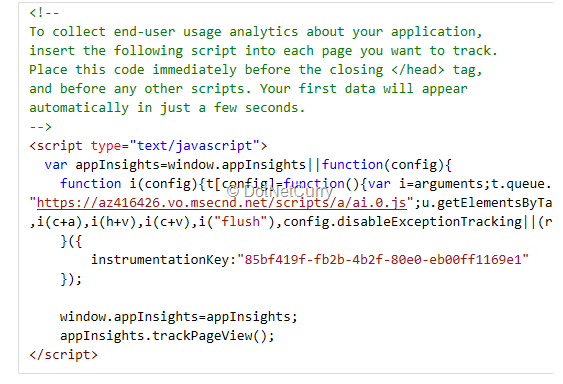 For an application to publish data to Application Insights, we need to add Application Insights SDK to it. This can be done while the application is created in Visual Studio, or afterwards, when it is ready to be published. 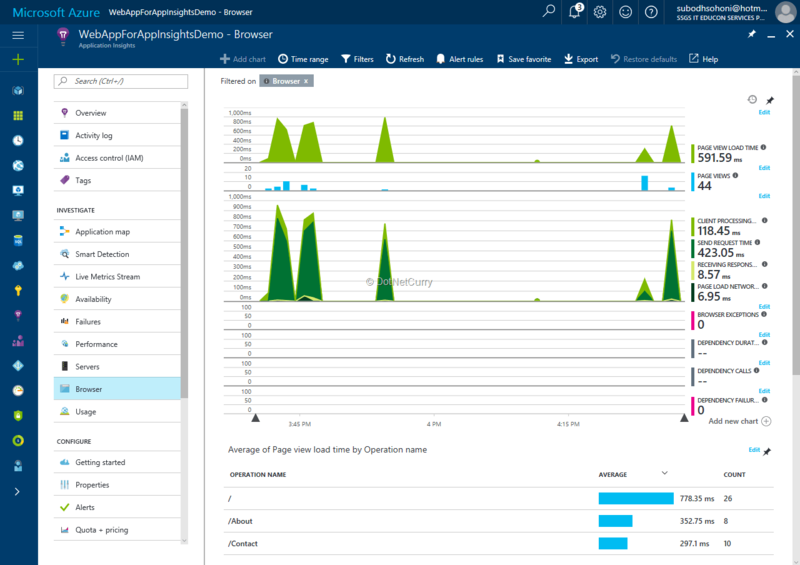 Once the application is ready to publish the Application Insights data, it needs to be registered to the Application Insights service of Azure. I am assuming here that an Azure account is already created and available. 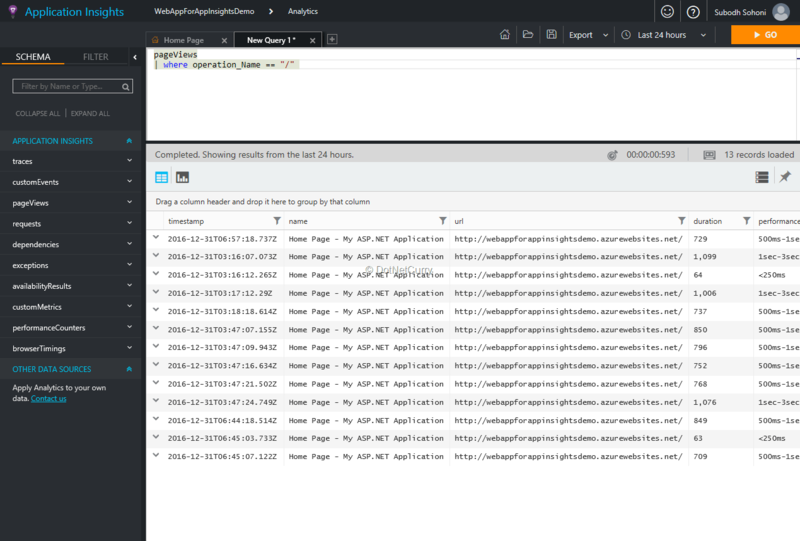 As soon as the application is registered with Application Insights and starts running (even in debug mode in Visual Studio), it starts publishing data. 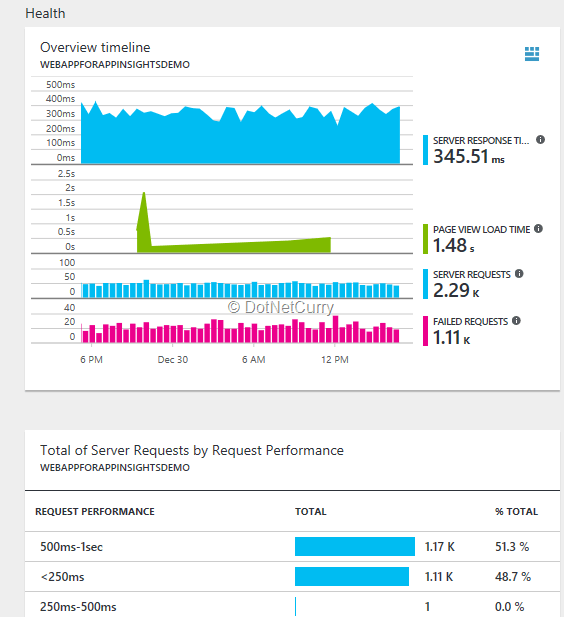 We can observe this data on Application Insights of the Azure portal. 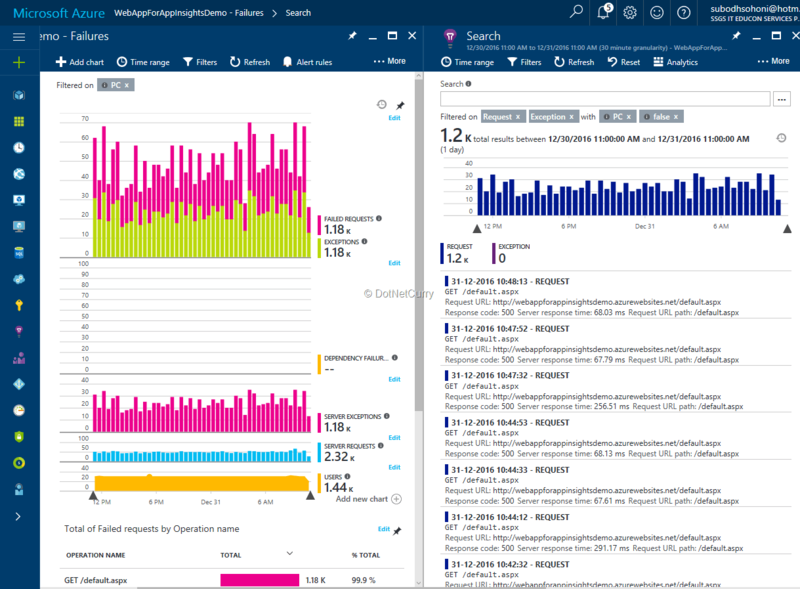 The default blade of Application Insights shows overview of data related to health of the application, and requests received for each page of the application. Each of the blades of Application Insights provides us with a different perspective to data that is collected. It is an analysed view of the data in a graphical format. We can set the begin and end timestamp to set the scope of analysis on the timeline. Application Map – This blade shows us graphics of various components of the application, and related statistics. It also shows summary of the status of each component. That summary includes the requests or calls received, performance per request, errors or failures and link to drilldown for details of these parameters. 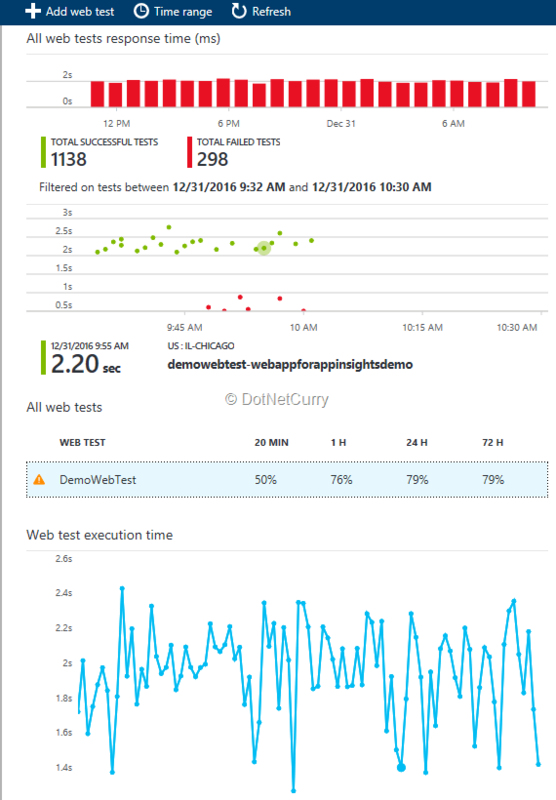 Availability – To check availability, Application Insights uses web tests that run at a predetermined periodicity. Initially there are no web tests available for us and we need to create at the least one web test for collecting the availability data. In Figure 7, you can see that we can set the frequency at which the test will execute, success criteria, alert criteria etc. This test will be run at a time from 5 locations. Failure of test from 3 locations will send an alert for failure of test. Once the test is configured, we can view the availability metrics. 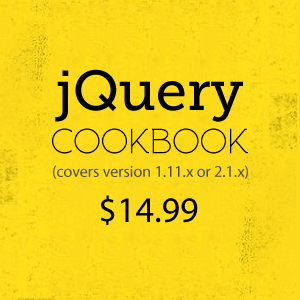 Queries use a special language that is similar to SQL. We can create a query graphically by first selecting the metrics to be queried, say pageViews. Then we can apply filters on that to get list or a graph of the results. For example, pageViews | where operation_name == “/” will show the results in a list / tabular form as in Figure 14. We can also view the results in a graphical form. A query on availabilityResults summarized by location of test, shows a pie chart as in Figure 15. 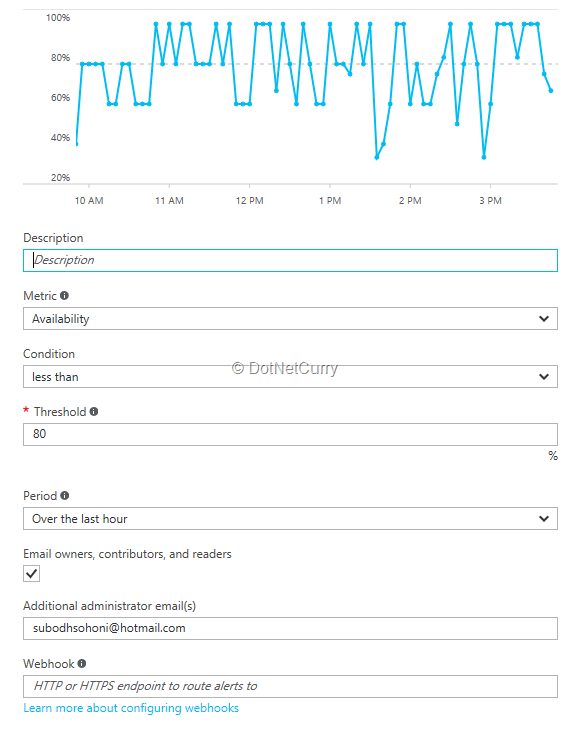 Application Insights also facilitates setting email alerts for various conditions. For example, we can set alert for availability based upon the web test that we had created. 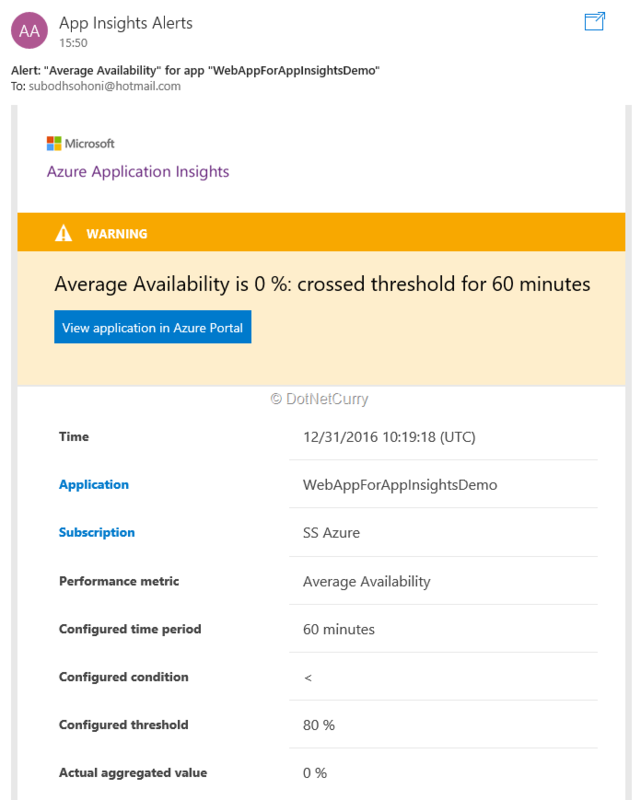 We can set a threshold limit and if availability is below the limit, we can have an email delivered to us by Application Insights. This alert will look like the one shown in Figure 17. DevOps strategy cannot be complete without monitoring and analyzing the health and performance of the application that is deployed. 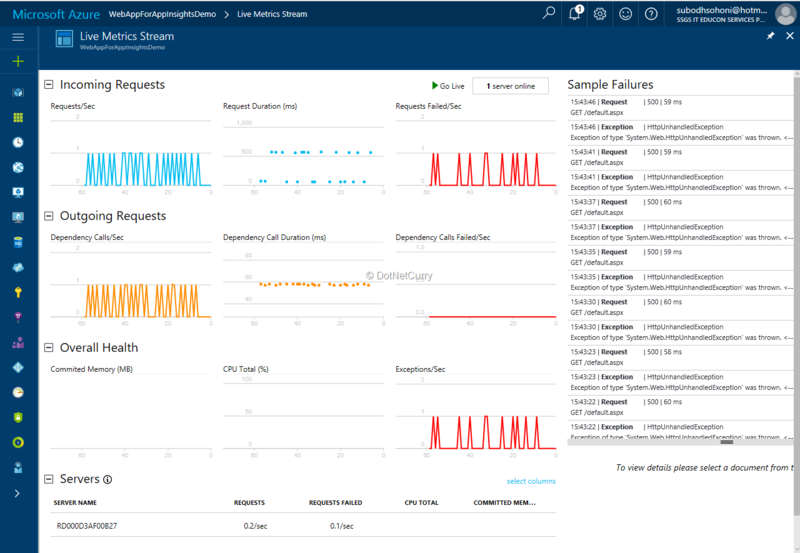 Microsoft has provided Application Insights, an Azure based service which makes it possible to monitor any application to constantly know availability of the application, failures and performance. It also provides an easy interface to query and analyse data for creating tabular and graphical reports. For critical conditions, Application Insights, can also be configured to send alerts to our email addresses.